Today, Swiftech announced the release of the H220 successor, the H220-X. 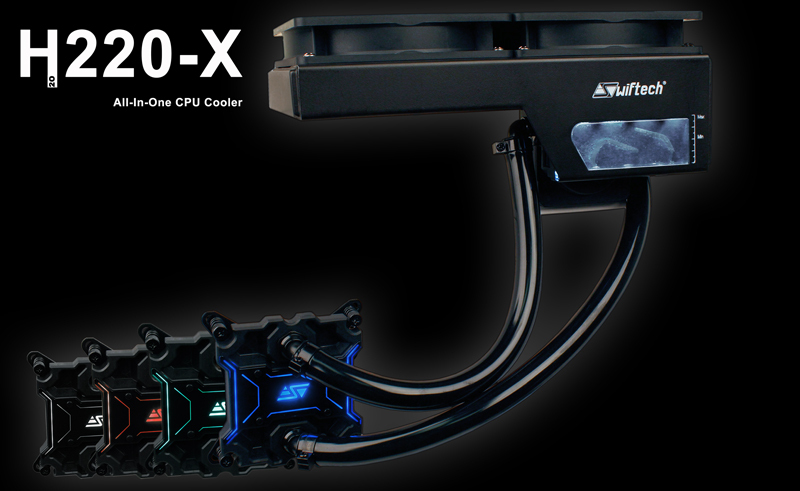 The unit features Swiftech’s flagship Apogee XL waterblock and a pump that is integrated into the 240 mm radiator. We have a review sample headed our way, so stay tuned for that! Here is the press release we received today. Rouchon Industries Inc., dba Swiftech® (OTC Pink Current: RCHN) today announced the release of the H220-X all-in-one CPU liquid cooling kit. The patent pending H220-X liquid cooling system is Swiftech’s next generation all-in-one CPU cooler featuring a dual 120mm copper radiator coupled to an enthusiast grade pump and water-block. As in previous Swiftech® offerings, the product remains entirely focused on low to inaudible operating noise with extreme thermal performance, and it is engineered to appeal to the broadest possible spectrum of performance oriented users ranging from casual to hard-core enthusiasts. For casual users, the kit is shipped factory pre-filled, ready for plug-and-play installation, and it is maintenance free during its three year warranty period. For enthusiast users, the kit can be fully customized thanks to easily replaceable tubing and fittings, and its powerful pump can easily support additional components such as graphics cards and/or extra radiator(s). The H220-X leverages Swiftech’s patent pending technology initially developed for the MCR-X20 Drive series of radiators, in which the pump is fully integrated into the radiator instead of being built into the waterblock. It features a compact dual 120mm copper and brass radiator, a built-in backlit reservoir with visible coolant level, and Swiftech’s recently released flagship Apogee™ XL waterblock for extreme cooling performance. Gabriel Rouchon, Swiftech’s chairman and CEO declared: “Our patent pending technology is the result of years of development and it clearly demonstrates Swiftech’s ability to think outside the box. The H220-X CPU cooling kit embodies everything we stand for at Swiftech®: innovation, performance, quality, and most importantly an unwavering dedication to our customers. I also want to take this opportunity to thank the entire staff at Swiftech for the passion and perseverance that have led us to this moment. Development of the H220-X has allowed us to implement several key enhancements to the pump that is also at the heart of the original H220 kit, and the H220 will continue to be marketed in regions where intellectual property rights are not disputed; in the end, both H220 and H220-X have greatly benefited from these efforts, and I look forward to see them fill different market niches based on users tastes and preferences”. Once our sample arrives, we’ll be sure and get our review up as quickly as possible! I would love to see Martin's Liquid Lab do a review.